My preferred method of cooking is to take what I’ve learned from a combination of kitchen-osmosis and reading an endless flow of cookbooks, magazines, blogs and apply to something that I’ve never created before, just to see how it turns out. Most times, this turns out rather well for me. Every so often, however, a dish won’t go quite how I planned. In some ways, these are the dishes I enjoy the most, as making them work tests my creativity and the depth of what I’ve learned. This Veggie Beef Soup is one of those ventures. 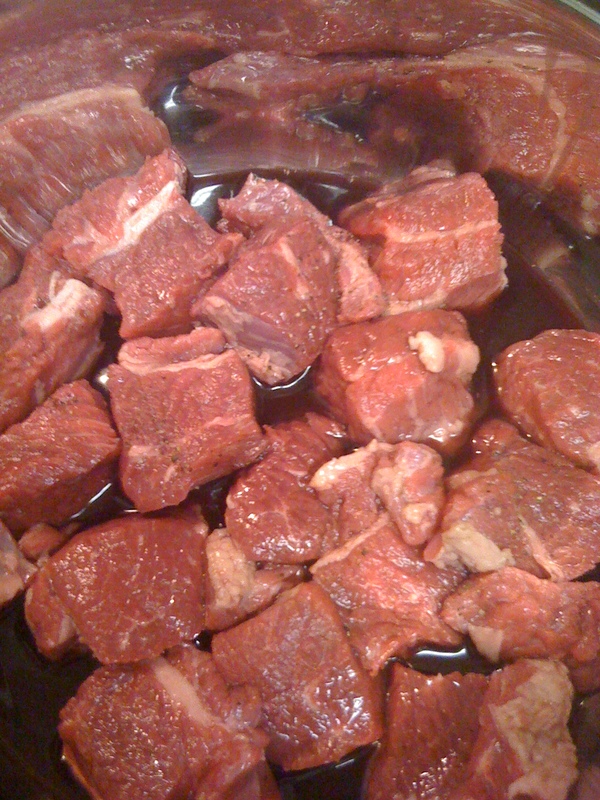 Start with 1lb of beef in red wine. I started with 1lb of beef brisket. (Note that I originally asked for chuck roast, as I wanted the beef in this soup to have the tender, falling apart consistency of a pot roast. My first challenge in this soup was the result of listening to my butcher, rather than trusting my instincts.) I removed as much of the exterior fat as possible, cut it into cubes, and put it in the bottom of a 4 quart pot with some red wine, salt, pepper, and 2 cloves of garlic that I smooshed with the flat side of my blade. While the outside of the beef cubes browned a bit, I worked on chopping my veggies. 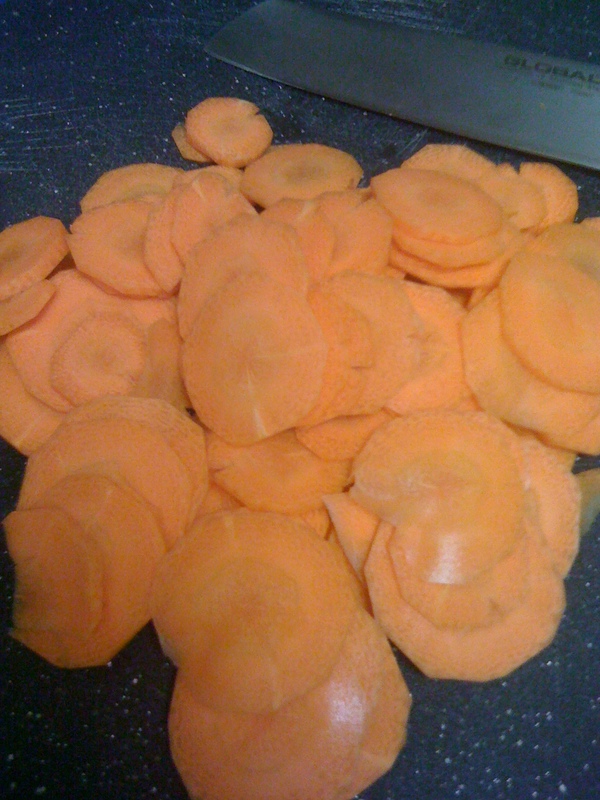 Slice your carrots into thin discs. Slice one LARGE (seriously – this was a behemoth vegetable) carrot into thin disks, cube 2 medium red potatoes, and chop one bundle of scallions (both the white and green parts). Set the veggies aside. 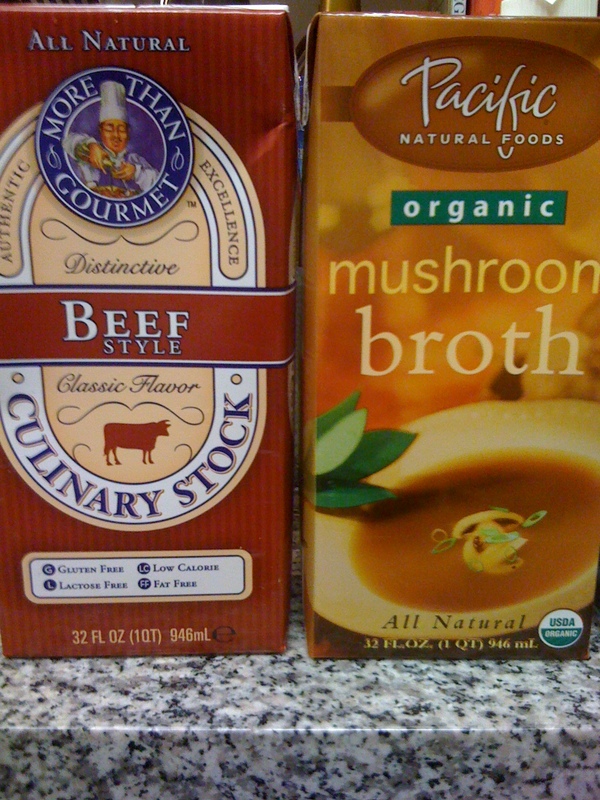 Add one quart of beef stock and one quart of mushroom broth to the beef. Stir, scraping up and brown bits on from the bottom of your pot, cover, and let it simmer for another 10 minutes. Add your veggies to the pot and recover. Take one 10 oz bag of frozen corn and rinse it in a strainer until it’s no longer cold to the touch. (While I’d prefer to use fresh, the ears at my supermarket didn’t look so great, so I opted for frozen.) Add the corn to your soup. Cover and let simmer for 2 hours on a medium heat, stirring about every half hour. Add another 1/4 cup of red wine about half way through. My goal for this soup was to encourage the beef to fall apart in that delicious, stringy way that pot roast does without making a pot roast. However, as brisket is a beef that is generally cooked longer than pot roast, I needed to encourage it along. 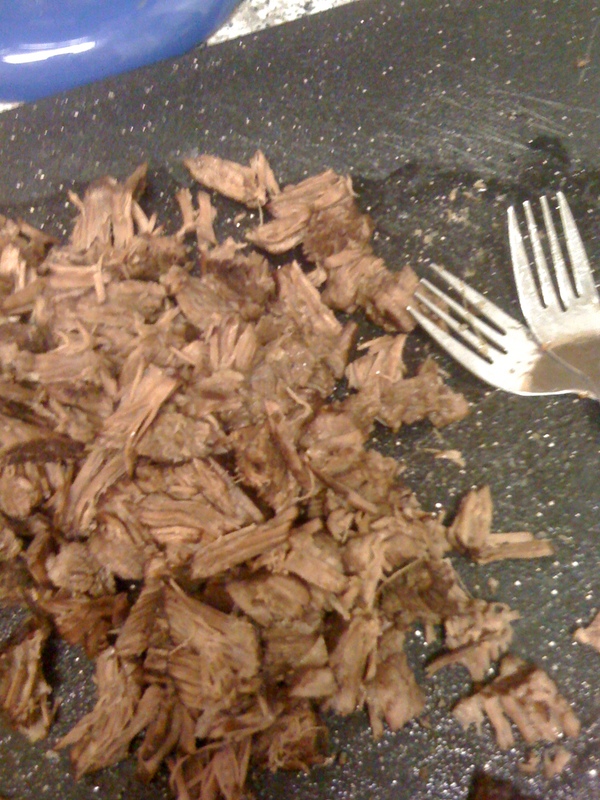 After two hours of simmering, use tongs to remove your chunks of beef from your soup. Add 1/3 of a pound of ditalini to the soup and recover. Pull your beef apart to achieve the desired stringy texture. At this point, I encourage you to experiment with the texture of your soup. If you enjoy thicker, heartier soups, then let your creation simmer for another 5 minutes or until the ditalini is cooked. (It should take about 10 minutes total.) 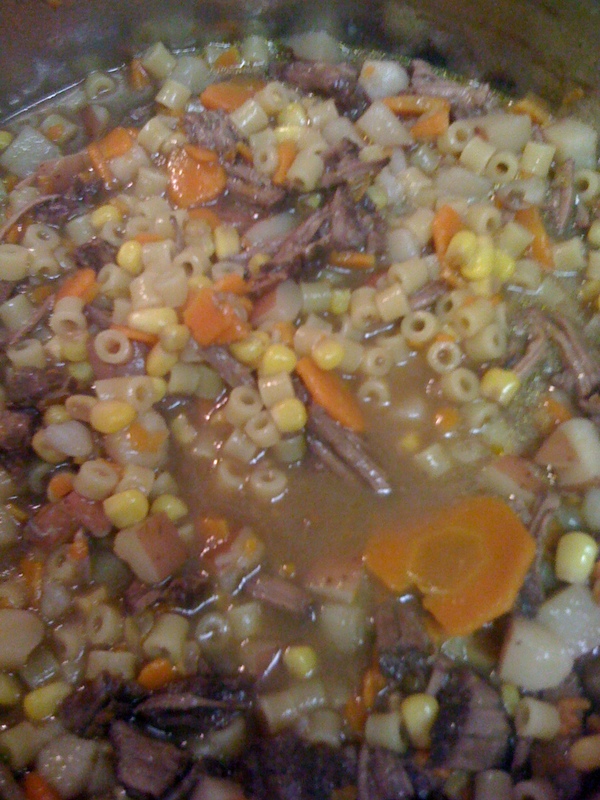 Note that the ditalini will continue to soak up liquid leaving you with a thick stew. If you prefer your broth thinner and more in line with the traditional definition of soup, add another quart of beef BROTH (not stock – you don’t need that strong of a flavor at this point,) and let simmer til the ditalini is cooked. Enjoy!! The final product: a hearty beef and veggie soup!